We are all beggars at the Wednesday Healing Service. Every week a group of faithful folks gather to seek God’s healing through prayer, touch and the Blessed Sacrament. We come together in humility and in hope, trusting in God’s love and care for us. We knowGod loves us. We knowGod wants us to be whole, right? We ‘get’ this, intellectually. We come with our broken bodies and souls, with our deepest desires and dreams, and with our fears, to the altar of God to receive the whole-making food and drink of Jesus’ body and blood. And, we come for one another. This little community of folks on Wednesdays come from all walks of life and experience, but we all have one thing in common. We love God and know that it is from God that all blessings flow. We know that these blessings flow to everyone, no matter who they are, or how hard they try to follow. Jesus’ healing, whole-making, supernatural power is for everyone. And we all hold that truth for one another. We lay our hands on each other, praying for each other’s well-being and deep healing. We walk together in faith, holding one another in God’s grace and compassion, knowing that sometimes we’re called to walk the path without being able to see the path in front of us. We walk together with God as our guide. A mentor and spiritual giant once told me that ministry together can be summed up in one phrase: “It’s just one beggar showing another beggar where the bread is.” None of us has life in herself, so says Paul’s letter to the Romans. We have our life, our being, our everything in Christ Jesus. And we are given friends, loved ones, sojourners on the journey, to know and experience the love of Christ incarnated, made flesh. We are all sojourners, journey men and women, children and heirs, and beggars when we kneel at the altar together seeking God’s healing. 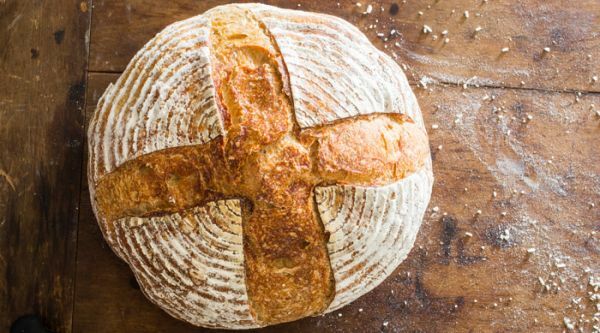 And, this bread that we share is the food that brings life to the world. It is Jesus that we share, and it is Jesus who heals us.